The goal of Read Scripture is that everyone would read the Bible for themselves and discover the truth and beauty of God’s Word. To this end, we are curating a year-long Bible reading plan and supplementing the reading with amazingly creative videos (produced by our friends at the Bible Project) that explain every book of the Bible, major theological themes of the gospel, and tips on how to read the Bible. We house all of this content in a beautifully designed app that is available to download in the App Store. We encourage you to experience Read Scripture in community but it is set up so that you can go through it on your own. Hark! A Read Scripture Update! 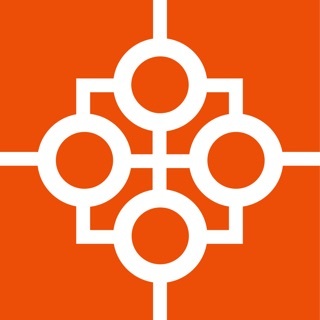 In addition to several small bug fixes, we have added a more robust video player to solve connection and audio issues. I give this 5 Stars. A really great app. Probably the best for reading the whole Scripture. Our whole church is going through this right now. We started in January. At the first of the year, one always knew where we were because the Psalms number was the same as the number of the day of the year. That is Feb 28 was day 58. This only works if you start at the first of the year. A lot of people do not. In the second half, if you got behind and were trying to catch up, it was hard to know your target, and it was hard to get in sync with the rest of the Church. May I suggest: when one starts the app, inter the date and add a calendar to the program so you can refer to it and keep up, knowing where you should be. Also the videos are so tiny I have to use a magnifying glass to read them. Please allow us to enlarge them. Maybe you could allow a full size print out of the visual, as well, (or a video download). Allow us to highlight and copy and paste a passage for memorizing. Other then that you deserve SEVEN stars. God bless you and your families. God Lives Through This App! 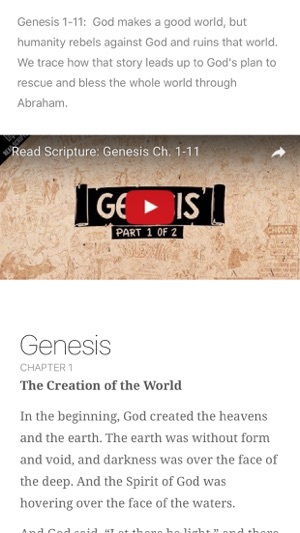 I was reading in my YouVersion Bible plan, and stumbled upon a video. It was an amazing overview of the books, within really cool animations. I showed my 10-year-old a few videos from the app, and he was in awe of the Comic-book-style renderings. He said it made the Bible so much more readable because it became fun. (But I have to admit, I think I'm more hooked on these videos than he is.) There are various artistic creations - from what look like comics, to beautiful scenes that look like they were painted in watercolors. Of course, the app isn't just a bunch of videos. Do you ever look at scripture and wonder why there are line breaks and poetic-style passages? Well, not any more. 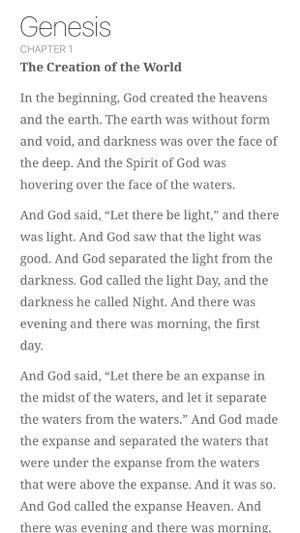 Put into actual paragraphs, the Bible is an amazing read. Almost like a novel. Because of that, I find that I'm much better absorbing, and comprehending, what I read. The Bible has always been a bit off to me because of the style. Now I actually enjoy reading it. I don't have even one negative to present. This is by far my favorite app of all time, and I hope everyone realizes the amount of time, effort, and super creativity that has been put into it. 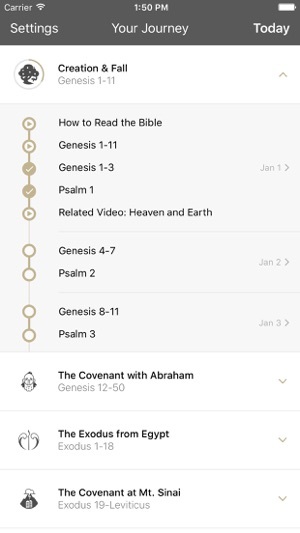 I’ve used more bible reading plans and apps over the years than I can count. Any method that gets a person into a routine of reading the Word is great, but this one is by far my favorite. Every little detail has been a blessing to me, down to the reminder at the beginning of each reading to take a deep breath. It reminds me to pause, be still, rest, and be reverent, instead of treating the daily reading like a task or chore. 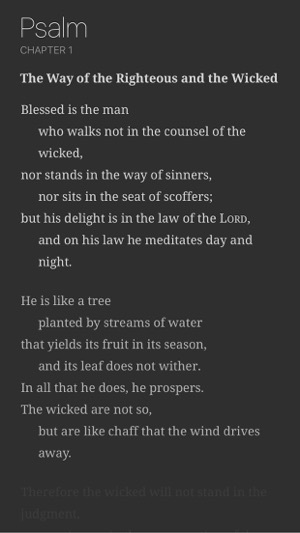 I love that there is a psalm as well as a sequential reading for each day. It’s also wonderful to have the plan not attached to calendar dates. It keeps me from feeling guilty or overwhelmed (both of which often convince me to just give up on a plan altogether) if I fall behind. Sometimes I need a day away from the plan because I feel led to study something else, and I appreciate that it doesn’t leave me feeling like I need to “catch up.” The videos have been a great source of insight, too! Love this app.